Retroreflectivity is everywhere. It's painted onto your street as line markers. It's printed on the stop sign at the end of it. It's sewn into technical clothing. It's even on the moon, thanks to Apollo. And increasingly, it's riding down the street next to you. 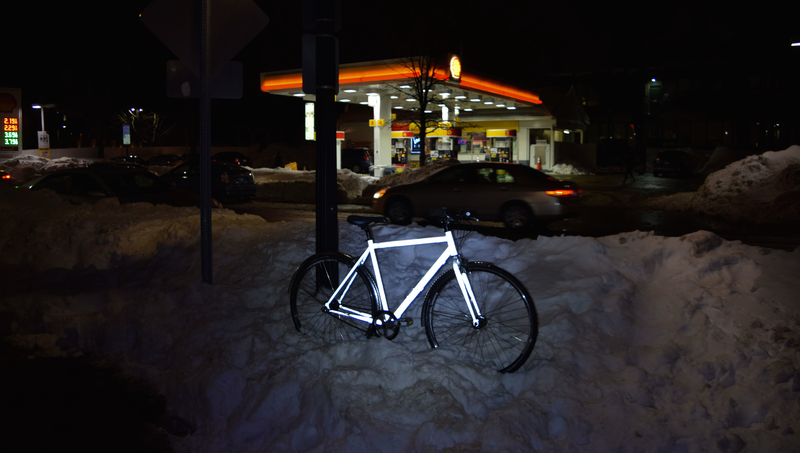 Hub Bicycle Company, a 5-year-old bike shop in Cambridge, Massachusetts, became the first bike shop to offer retroreflective paint jobs on bikes this winter. The company's founder, Emily Thibodeau, teamed up with an industrial company called Halo Coatings that has patented the only powder form of retroreflective paint—mostly for use on highway guardrails and other infrastructure applications—to let customers pay to turn their bikes into moving light sources. It looks completely awesome, and as an added bonus, it helps get you seen on the road. For $329 (or $419 for shipped bikes), Thibodeau and her team at Hub Powderworks will take your bike frame and hang it from a wire, spraying electrostatically-charged particles of retroreflective paint on it until it's completely coated. Then it goes into an oven, where the paint is solidified into a solid coat of super-strong industrial-strength paint that looks grey in normal light, but glows a bright white in head-on lights at night. "It doesn't get old when people pull up next to me at a light and ask me what's going on with my bike," says Josh Zisson, a partner Halo who worked with Thibodeau to launch the service. The optical phenomenon known as retroreflection plays a huge role in our world, but few of us really understand the science at play when our cats' eyes reflect a spooky glow or when a bike's reflector lights up on the street next to us. Here's the simple version: When light bounces off a normal material—your hand, say, or your car, it scatters light in all directions. Retroreflective materials reflect light back at their source directly, without scattering—which makes it glow brightly when you're near the light source. The story of how our infrastructure got lit up is actually pretty interesting. Retroreflective materials were actually first developed for a very different industry: the movies. In the 1930s, a company called Potters developed a kind of tiny glass sphere that could reflect light directly back at the source. According to the The Retroreflective Equipment Manufacturers Association's John Lloyd, these beads were "only a fraction of a millimetre in diameter which were first used on the cinema's 'silver screens' giving a much brighter image." Soon, Potters was looking for new applications for its screen-boosting beads, writes Lloyd, and it found one by pouring the beads on wet paint or sticky material to create bright road signs or road blocks. Before long, other companies were making their own retroreflective coatings, and the American street grid began getting a whole lot brighter. Even today, Potters still makes its bead powder, selling it in sacks to states that blow it onto wet road paint to turn it bright. As research into optics progressed, aerospace engineers and astronomers got involved. In fact, retroreflectivity played a role in the Apollo missions 11, 14, and 15—all three of which installed retroreflective mirrors on the moon that, even today, are still being used by NASA to measure the exact distance of the moon from Earth. 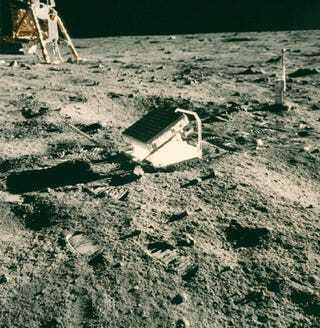 NASA blasts a laser at the retroreflective array on the moon, which reflects back exactly the same beam, allowing astronomers to measure how far away it is. According to NASA, it's the last Apollo experiment that is still returning data. Retroreflectivity has played a major role in the modern world, but it's the product of industrial manufacturing processes, and applying it takes specialized machinery and expertise. So if you want to coat something you own in it, it's always been tough to buy it or find a company that will apply it. Halo, which holds the patent to the technology that Hub uses, used to get requests for bike painting all the time. "For years, we've been telling people 'thanks for your interest. We're really sorry, there's nothing we can do,'" says Zisson. Now, people can come directly to Hub and pay for a service that's only been available to large-scale industrial buyers for decades. Eventually, they may end up offering it for other devices and products, too. In the end, Thibodeau and Zisson's story illustrates a fascinating and unusual trajectory for an industrial technology. A material that was developed in the 1930s and used consistently in every city, town, and country road in the country for decades, has now been licensed to offer individual consumers a beautiful form of customization. You can sign up to have your bike painted here—or check out Hub's website right here. All images courtesy of Hub Powderworks unless otherwise noted.